Under the law, teachers and school administrators would have the power to petition a judge to remove guns from the homes of students deemed troublesome. Family members and law enforcement agencies would also be able to approach the court about the removal of guns from homes. Cuomo said the law would “prevent individuals determined by a court to be likely to engage in conduct that would result in serious harm to themselves or others from purchasing, possessing, or attempting to purchase or possess any type of firearm, including handguns, rifles, or shotguns." "By expanding background checks and extreme risk protection orders, New York is once again demonstrating the leadership we need to address our nationwide epidemic of gun violence," Lt. Gov. Kathy Hochul added. "These bold actions take the next step forward and address the continued threat of gun violence. No person should ever fear going to school, or a concert, or a house of worship. While Washington refuses to act to save lives, New York will lead the way to enact commonsense reforms to prevent senseless tragedy." “We commend Governor Cuomo for joining us in calling on the legislature to enact the Extreme Risk Protection Order law immediately so concerned parents, law enforcement and teachers can petition a judge to temporarily remove firearms from individuals who pose a danger to themselves or others. New York State needs a Red Flag bill now,” Westchester County District Attorney Anthony Scarpino said in a statement. 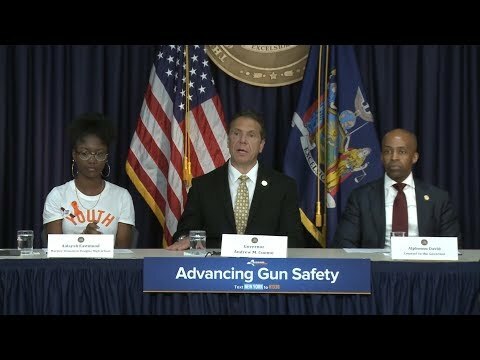 In the past, Cuomo has also pushed for legislation to extend the background check waiting period from three to 10 days. “I've spoken with many educators in Parkland, Florida and heard repeatedly that the shooter showed clear signs that he was a troubled soul,” AFT President Randi Weingarten stated. “It's no surprise as the Brady Campaign reports 42 percent of mass shooters exhibit warning signs beforehand.